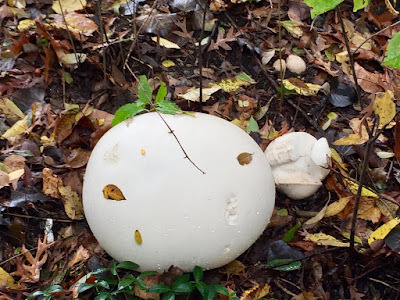 Okay, it’s not a furry friend this Saturday but rather an “autumn friend.” Calvatia gigantea, commonly known as the “giant puffball”, is a puffball mushroom commonly found in meadows, fields, and deciduous forests usually in late summer and autumn. This one was found around St. Joseph’s Lake and is the size of a basketball. Are they edible? Well, all “true” puffballs are considered edible when immature, but can cause digestive upset if the spores have begun to form. This is indicated by the color of the puffball turning to an off white. On eating this giant puffball, Fr. Terry Ehrman, C.S.C., said, "I'll pass. I would rather enjoy it from afar. Who knows? Maybe a squirrel might want to a nibble or two."